This LED glow wall charger with dual USB ports are a highly durable, ultra-compact, universal charger for Apple and Android smartphones and tablets, ideal for travel, home or office. Built-in green LED lights makes charging easily done while at night and it also makes boring charges interesting, cool and romantic. This dual USB power adapter features a 2.1Amp output, which enables to charge your phone or pad simultaneously, at maximum speed. NOTE: The LED light won't shut down automatically after devices fully charged, please pull the charger out of the power outlet to turn it off. Don't touch the charger when your hand is wet. Don't leave far away from your phone & devices when it's charging. Don't use with defective USB cable. Store away from sparks, flames. Keep out of reach of children. Compatible With: Apple: iPhone 6/6 Plus/6S/6S Plus/SE/5S/5C/4S iPad 2/3/Mini iPod Touch etc. Samsung: Galaxy S4/S5/S6/S6 Edge/S6 Edge Plus/S7/S7 Edge Note 3/4/5 A7/9/Grand Prime. HTC: One M9/M8/M7 Mini/Desire Eye/M910X/Desire 820 /Butterfly 2/Desire 510. LG: G2/G3/G4/G5 Nexus 5 D820. Motorola: Droid Turbo/Moto X 2014/Moto X Pure/New Moto X. Nokia: N1 Table Lumia 920/950/1020. Google: Nexus 4G 5/6/7/5X/6P. Huawei: Honor 5X/Mate 2/Mate 7/Ascend P6/P7/P8/Media pad X2/Honor 7 /Ascend Y536 /Honor 4C/P8 Lite/P8 Max. BLU: Advance 5.0/Advance 4.0/Life One X/Studio Energy 2. ASUS ZenFone 2. Specification: Input: 100-240V 50/60 HZ. Output 1:DC5V-1A. Output 2:DC5V-2.1A. Size: 25 x 40 x 70(mm). Package Include: 2.1 A wall charger x 3. This Dual Usb European power adapter features a 2.1Amp/5V output, which enables to charge your two smart phone or tablet devices simultaneously at maximum speed. You can use this European wall charger power adapter when you travel or live in these countries: France, Germany, Italy, Spain, Portugal, Poland, Romania, Greece, Turkey, Holland, Finland, Sweden, Belgium, Cyprus, Norway, Bahrain, Luxemburg, Switzerland, Yugoslavia, Serbia, Saudi Arabia, Iran, Ukraine, Slovenia, Saudi Arabia, Bosnia and Herzegovina. Compatible with most mobile phone and other USB-enabled tablet devices, Such as Apple iPhone 7 Plus 6s 6 SE 5S 5C 5 4S, Ipad Air Mini Pro, Samsung Galaxy S7 S6 Edge S6 S5 Note 5/4, Tablet, HTC One M10 M9 M8 M7, LG G2 G3 G4 G5, Nexus 5 6 7 9, Blackberry, Huawei, ZTE and more. Input:100-240V 50/60 Hz 0.5A (European plug), Output: 2.1Amp 5V. 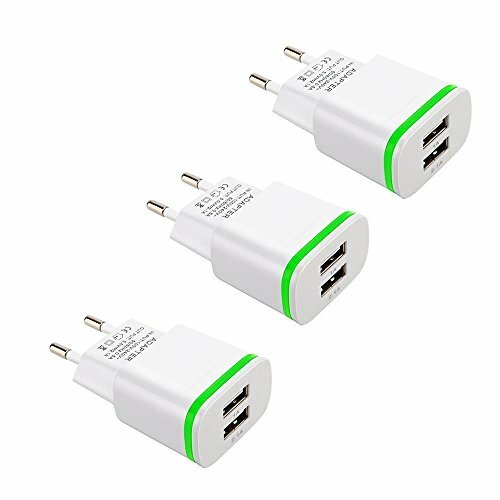 Package: European USB 2.1A Wall Charger x3,12 month and friendly customer service. If you have any questions about this product by Power-7, contact us by completing and submitting the form below. If you are looking for a specif part number, please include it with your message.